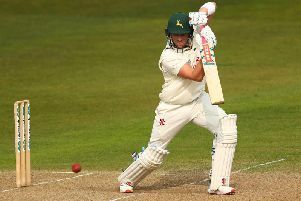 Nottinghamshire stand-in captain Chris Nash praised young seamer Matt Milnes as they required just an hour and three-quarters on the fourth morning of the Specsavers County Championship game at Chelmsford to remove the last six Essex wickets and claim a 301-run win. The 23 points gained from their fourth success at the halfway point of the season lifted Notts above Essex and Somerset into second place in Division One, 13 points behind leaders Surrey — and all without captain Steve Mullaney, away captaining England Lions. It was Notts’ first Championship win at Chelmsford since 1984, having lost four of their previous eight visits. Milnes, in only his third first-class match, claimed best figures of four for 44, two of the wickets in the morning’s play as Essex added just 51 runs to their overnight score to fall 302 short of their target of 441. Nash praised the young seamer for his four-wicket performance, saying: “The way he bowled first innings he deserved more. I thought the way he bowled to Alastair Cook was brilliant and I think he will have taken a huge amount from that. Essex paid for another top-order batting collapse that had left them 26 for three inside 11 overs and facing an uphill struggle the lower-order were never going to be able to meet. Ravi Bopara was the first to go for 39 from 62 balls, caught behind pushing forward to Matt Milnes and giving the substitute wicketkeeper Tom Keast his first victim in first-class cricket, just in time for his 20th birthday on Monday. Keast continued behind the stumps in the absence of Tom Moores, who twisted his ankle before the start of play on the third day. The injury had not stopped Moores batting with a runner and smashing 87 off 80 balls that took the game even further away from Essex during the previous afternoon. Keast, who plays for Notts 2nd XI but is not on staff, took his second catch in the next over when Jamie Porter’s 27-ball nightwatchman’s stint was ended by one that got up from Luke Fletcher. Porter, who did not register a run after going in at No6, had earlier seen out a maiden against Fletcher without undue concern. Adam Wheater and Simon Harmer put up a measure of resistance with a stand of 20 runs in six overs before Harry Gurney left Harmer’s stumps in disarray with his first ball of the morning. Wheater showed a degree of aggression when he hooked Milnes for four, but was Gurney’s second scalp when he played on and was bowled for 16 from 37 balls. Matt Coles then followed an outswinger from Milnes to give Keast his third catch. The end came at 12.45pm. when Neil Wagner turned Samit Patel into Ross Taylor’s hands at second slip. Nash added: “Ross [Taylor]’s innings was world-class and showed how good he is. Alongside that someone like Billy Root, who may only have made 36 but he was part of a partnership of over a hundred that set us up for rhe rest of the game. “We just said there were the headline acts, and rightly so. But alongside that there were some great performances from the whole team. Before Mooresy went at them yesterday we were thinking that 270-2809 would be a great lead. But he took it right out of their reach. He put in a massive shift for us. Essex stand-in captain Tom Westley admitted: “We’ve been outplayed. They played better cricket than us in the last four days. It’s bitterly disappointing. We set ourselves hard standards, but unfortunately we weren’t good enough in this game. It’s been a good cricket wicket, but we didn’t bat well enough on it and they bowled better than us on it. There are no excuses about the wicket. We didn’t play as well as we can. “That final partnership of around 60 did take it away from us. Well played to him [Tom Moores], he was obviously struggling with an injury. He kept hitting sixes – at one point we had everyone on the boundary and he kept hitting it over us, which was frustrating.